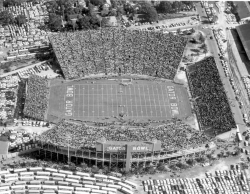 Making its debut shortly after the conclusion of World War II, the Gator Bowl in Jacksonville was primarily used as a college football facility, hosting the annual Georgia-Florida game for sixty years as well as the Gator Bowl from 1946 to 1993. It also played host to the World Football League's Jacksonville Sharks and Express as well as the North American Soccer League's Tea Men. The USFL's Jacksonville Bulls were the only professional football team to call the facility home in its original configuration, playing at the Gator Bowl in 1983 and 1984 and drawing some of the largest crowds in the league's brief history. Some observers believed that the NFL's surprise decision to expand to Jacksonville for 1995 was predicated in part on the Bulls' ability to draw fans. When Wayne Weaver was awarded an NFL franchise for Jacksonville to begin play in 1995, the Gator Bowl underwent a complete overhaul that left few areas of the original facility standing. Once the construction was completed, the stadium was rechristened Alltel Stadium in favor of a corporate benefactor, and today is known simply as Jacksonville Municipal Stadium.